Ever have those moments when an object, a scent, a word, blasts you off to a time long ago? The smell of bread rising or vanilla pudding sends me to my grandmother's side. We are sitting next to each other in her kitchen, giggling, while she makes tortillas or kneads dough. Sometimes we are spreading butter on warm bread, fresh out of the oven. Old Spice. I'm standing in the doorway of my bedroom watching Dad head down the hall to catch a ride to work with one of his carpool buddies, John Henneberry! Today I watched the last Season 4 episode of Frankie and Grace. Frankie reached out and pulled her fondue pot off a shelf! It was my fondue pot!!! What a fun post! I can totally relate. I get transported all the time to the past like this. It is bittersweet sometimes because in some cases there are loved ones I get transported to that are no longer with us. It can be sad when we visit old memories of those who have passed but also joyful that we have rich memories of our time with them. My grandmother died when I was 14 but I feel very close to her...could be my fondness for fresh baked bread! 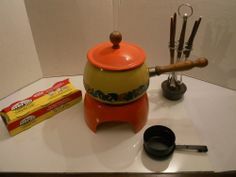 I remember seeing lots of those kinds of fondue pots in the 70s too, lol! I laughed so hard when I saw it. Reminded me that I am much more like Frankie than Grace!